I almost missed it, then I had no idea what the heck it was. There, among the leaves, barely visible was this 13 or 14-inch long something-or-another. 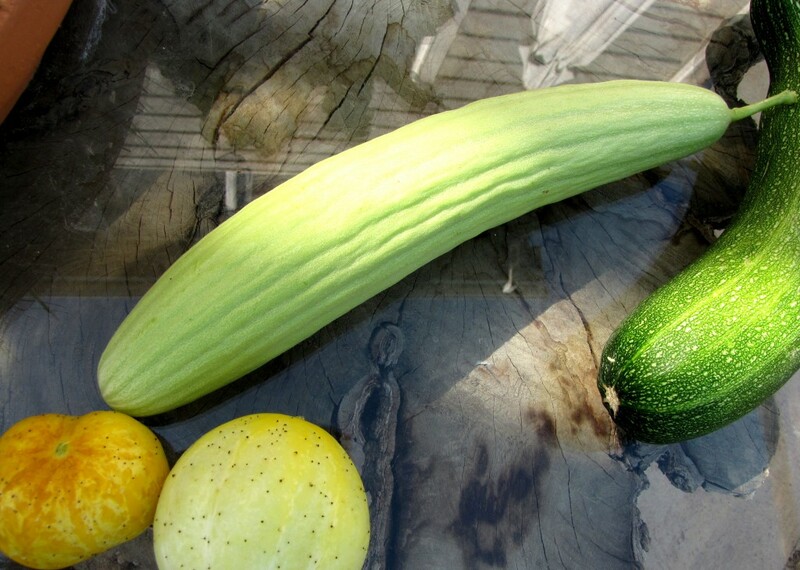 It was situated sort of between the lemon cukes (small, pale yellow and round, with defined ridges) and the English cucumbers (dark green, very straight variety), but also near the zucchini and yellow straight-neck squash. It was the palest green, almost white. It was straight and ridged and extra long. I wasn’t sure what I would find when I cut into it. But it was just a very unique cucumber. It was juicy and tender and just right for eating, despite its size (large ones often have very undesirable tough, bitter seeds in them). I am not sure what has been going on out there under the leafy, vining covering, but there has been some mixing it up, for sure! What am I running here, some sort of Jurassic Park? Sometimes the plants that don’t get the sun are good. When I was in Germany the first time, I arrived during “spargle” season. “Spargle” is a white asparagus which is grown underground, or at least under mulch. They are white, sweet and quite tender.